Inhale. 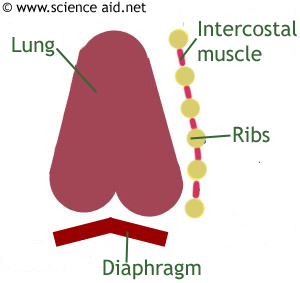 Intercostal muscles contract, moving chest up and out; the diaphragm contracts and flattens. These increase the volume, so decrease the pressure, thus drawing air into the lungs. Exhale. Intercostal muscles relax, chest moves down and in, the diaphragm relaxes, and domes upwards. 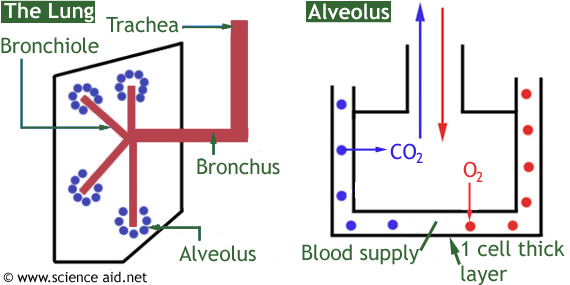 Volume decreases, pressure increases and air is forced out of the lungs. It is vital that we can control the rate of breathing to maintain a constant carbon dioxide and oxygen level in the body. This is done by three different processes, which are coordinated by the medulla in the brain. In the lungs are stretch receptors that recognize how inflated they are. When they reach a certain point they are instructed to deflate. In the aorta are chemoreceptor cells. These can detect the concentration of carbon dioxide in the blood. If it starts getting higher, they will signal for an increase in breathing rate. And finally there is the medulla itself which also responds to the levels of carbon dioxide in the blood.